Very sad news. Eleven Philippine Babblers no longer exist! On a happier note, Eleven new Philippine White-eyes have been discovered! Very sad news. The bird of the White-eye group of birds, the Cinnamon Ibon, no longer exists. On a happier note, a new Old World Sparrow has just been discovered. The Cinnamon Ibon. Thanks for the news Sir Steve. As I understand it, the species have been reclassified, are they? Can you please list the affected species? All of the Stachyris "Babblers" ranging in Phils, have been moved into Zosteropidae. I am preparing a spreadsheet putting the WBCP birdlist in comparison with the International Ornithological Congress (IOC) indications for the homologation of nomenclature. Part of their work, however, exceeds their initial mandate (that of the mere homologation of the English Common Names of birds) and has passed into revisions regarding the actual phylogeny of birds. Some of their taxonomical revisions I do not agree with, however, in the case of these "Babblers", by and large, I do. As soon as I get the comparative spreadsheet done, I will send it to Des and have him look at it, and then I will likely upload it to this site. Thanks for the info Sir Steve. text - can not figure out which of the tag functions can be used to upload (directly from my HDD, not from a hosting site) an Excel file! I have you tube, blockquote, insert hyperlink, insert image, insert table, insert table row, insert table column cell, superscript, subscript, teletype, insert code, insert quote, insert list. Which can be used for an Excel file? You can use the attachment option of the board as long as your file does not exceed 1MB (which I believe does not). In the reply page, you will see a "Browse..." button below the Subject field. It is the button located above all the other buttons you mentioned in your last post. You may now browse your computer and select the file you want attached to your message. Thanks Eric. As you surmised, I was using the Quick Reply. Thanks for the list Sir Steve. I noticed that the re-classification is listed side-by-side with that used by WBCP. Is this already the official list we will use or will you still deliberate it with the Records Committee? The list is not to be used in lieu of the WBCP birdlist that should be used until some sort of decision might be taken in merit. That may be anywhere from a year, or two years off, and it will almost certainly be after the Howard & Moore, 4th Ed. comes out, presumably somewhere about the end of next year. So, you might ask, what is the purpose of this list? Well, I originally redacted it just for my own personal use, and just to have it handy when I started seeing others adopting many of the changes in taxonomy, in the grey literature of birding, such as trip reports, etc. There are a number of problems that I see with the IOC taxonomy, and so there are caveats to the IOC list itself, such as a very real bias favoring the PSC (Phylogenetic Species Concept) theory of avian speciation. To put it another way, there is a real need for peer-review of some of the more questionable splits now being listed by the IOC list. I consider this a result of a sort of taxonomic vaccum having been created since the last definitive textual taxonomic work which was the Howard & Moore, 3rd Ed. Since then there has been a veritable tsunami of genetic analysis vis-a-vis higher avian phylogenetics, and a whole lot of confusion with much uncertainty. Therefore, though I originally collated the list for my own personal use, it might be thought of a harbinger of what might be expected in the next couple of years when some of the kinks have been worked out. Certainly, in spite of the above drawbacks, there will be huge changes in taxonomy in the future, so we might as well be prepared for them. We gain another endemic with the association of Sabah-ranging race andrewsi to Chrysocolaptes guttacristatus - which takes it away from our Buff-spotted Flameback making it an endemic. We also gain back Cettia diphone canturians as a species, though now it is Horornis diphone canturians, after race canturians was again reassociated from Horornis (Cettia) borealis. 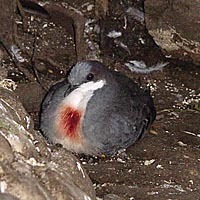 All other former philippine Cettia are also moved into Horornis. The two former Philippine Bradypterus, are now moved into genus Locustella.